Did you know? The band Phoenix wrote Lisztomania in honor of composer Franz Liszt‘s stud factor. 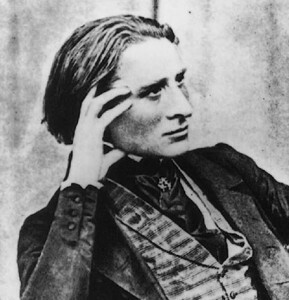 As for the term itself, “Lisztomania” was first coined by German critic/poet/journalist Heinrich Heine as he discussed the fanaticism and fandom surrounding virtuosic pianist and composer Franz Liszt. He was a bona fide chick magnet. And the phenomenon bore a striking resemblance to how today’s music fans revere icons such as Michael Jackson and The Beatles: swooning, screaming, and wearing broaches bearing Liszt’s portrait. Liszt lovers would fight over any physical souvenir possible; from coffee grounds, to cigar butts, and some even tried to steal locks of hair. A young, handsome, and enormously talented Franz Liszt. When formerly I heard of the fainting spells which broke out in Germany and specially in Berlin, when Liszt showed himself there, I shrugged my shoulders pityingly and thought: quiet sabbatarian Germany does not wish to lose the opportunity of getting the little necessary exercise permitted it… In their case, thought I, it is a matter of the spectacle for the spectacle’s sake…Thus I explained this Lisztomania, and looked on it as a sign of the politically unfree conditions existing beyond the Rhine. And that isn’t where “Lisztomania” ends, either! In 1975, a film called Lisztomania was released; it has a reputation for being a pretty terrible movie. Get started on your own Lisztomania with over an hour of Franz Liszt’s best!